*** FREE SHIPPING *** Now that’s POWER! Emco Tech, the manufacturer, has the most efficient and powerful, high quality ionization technology in the world. The result is THE next generation Vesta GL ionizer. With the most advanced features and technology, and backed up by Emco Tech durability and performance, the Vesta GL will provide you with years of the highest quality performance. Patented dual Biostone filtration ensures you peace of mind, knowing your water is not only alkaline and ionized, but cleaned. 9 high-efficiency platinum titanium electrodes deliver more power per square inch than larger less sophisticated electrodes requiring large wattage. Think small. Think efficient. AutoAdjust™ There are those who incorrectly say you need mega-watts of power and the largest plates to get the best ionization performance. It is also important to understand that the actual performance of these other ionizer brands always varies due to changes in the mineral levels present in your water. The fluctuation in mineral content creates unstable results from day to day and from place to place. The engineers who designed the Vesta GL created the most intelligent and efficient power delivery system available today. The Vesta GL is the only ionizer that overcomes this for you – automatically. The Vesta’s AutoAdjust™ technology consistently creates the ultimate pH and ORP by adjusting the way power is applied to the plates to match the amount of minerals present in your water. 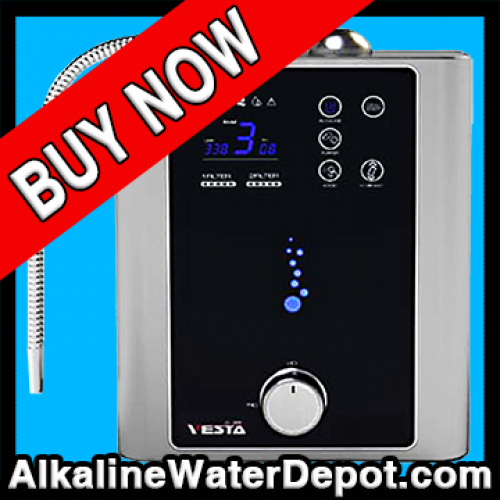 The Vesta GL is the first, and only ionizer that offers this level of intelligent sophistication and efficiency. More Activated Alkaline Water! Using advanced pulse width modulation, AutoAdjust™ delivers the electrical energy in variable short, sharp bursts or punches. AutoAdjust™ varies pulse time or widths based on the mineral content in your water as determined by the on-board computer. No other ionizer can do this. This causes the electrodes to act in a more excited and energetic way creating more active production of oxygen from the electrode, and therefore more activated water. The result is a bigger change in pH and better ORP. With AutoAdjust™ technology, you always get optimal performance and benefit, no matter where you live or what your water quality. Every time. Easy. Automatic. Smart Switch™ next generation SMPS power The Vesta GL uses state-of–the art Switch Mode Power Supply Technology in order to operate it’s unique AutoAdjust™ feature and extend the Vesta's performance. Other ionizers claim they operate with over 350 watts of power, as if that is somehow better. The reality is the more watts that are delivered, the more heat that will be generated inside your ionizer. It's a fact – and common sense – that excessive heat will damage anything. The surface of the plate is crucial to performance. When you constantly subject it to excessive power and heat, the plate and other components become subject to more rapid degradation, and your ionizer will ultimately deliver less performance. Especially over time. There is no sophistication in this mega-power approach. Any manufacturer can apply more power to the plates to improve performance. But at what cost to performance and durability? The Vesta GL's power plant is intelligently designed to deliver the most efficient power therefore minimizing heat and its damaging effect. This saves power and harmful stress to your ionizer while extending performance. Current generations of SMPS offered by other ionizer companies do not automatically adjust voltage on demand to match varying water conditions. The advanced SMPS used in the Vesta GL is able to deliver this cutting edge functionality – providing the best performance and protection. Efficient power. Optimal performance. Ultimate durability. That is the Vesta Smart Switch Technology. Biostone Filtration Patented dual filters consisting of 0.1 micron filters combine with space-fiber technology to efficiently filter almost any tap water. The filter life change indicator lets you know when it’s time to replace your filters. Only Emco Tech ionizers work with the USA made and certified Biostone Plus filters and with the Vesta GL you have the ability with two filters to really make sure your water is filtered properly. AutoClean All ionizers have cleaning systems which are crucial to performance and durability, but all cleaning systems are not created equal. One more important advantage of AutoAdjust™, is that calcium and other minerals cannot attach themselves to the electrodes. With the electrodes switching on and off so quickly and pulsing differing widths, minerals don't have the time or stability to form a bond with the surface of the electrode. Other less sophisticated ionizer brands cause you to periodically wait for your alkaline water. The AutoClean reversal mechanism operates in the background of the Vesta GL, always cleaning and never interrupting the flow of alkaline drinking water. You never have to wait or worry. Easy. Elegant. Effective! 9-Ultra Efficient Electrodes Made of the highest grade Titanium / Platinum for durability and efficient ionization. EmcoTech plate manufacturing remains state of the art, using proven best-practices - the choice for most ionizers sold worldwide. The Tennant Company chose to stake their reputation on Emco Tech plate performance and durability. Why wouldn’t you? Modern, Sleek Design, Small footprint and elegant black and stainless-look design complement any modern kitchen decor. The Emco Tech range of water ionizers has proven over the last several years that bigger is not necessarily better. What matters is the engineering ... how efficiently the electrical amperage is delivered to the electrode. Our ionizers out perform other brands with more or larger electrodes and more wattage, because more amps are delivered per square inch of electrode.